Highly recomended for Psoriasis patients with a liver-related disease. Unhealthy liver can contribute into the development and recurrance of psoriasis. It is important to cleanse the amounts of toxins in the liver in order to start the process of healing psoriasis from within. 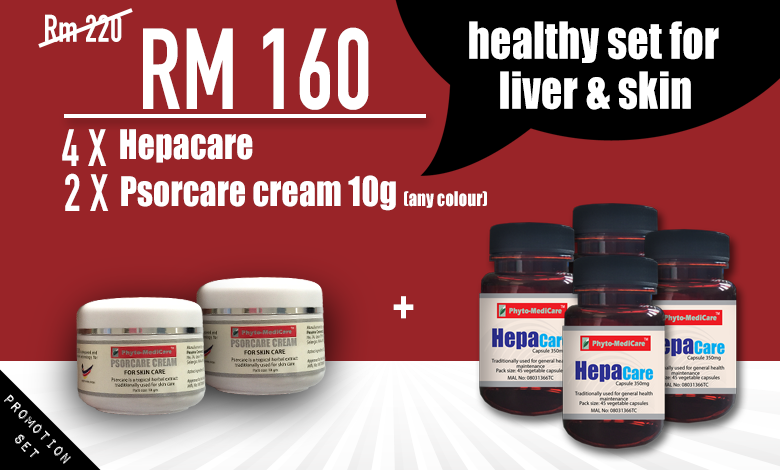 Set of 4 bottles of Hepacare and 2 jars of Psorcare Cream 10g. Add on RM90 and you will get Psorcare Lotion 100ml (original price RM120). For more details on Hepacare, click here. For more details on Psorcare Cream, click here. For more details on Psorcare Lotion, click here.